For those who consider themselves fashion cognoscenti, it is a given that the name Jean Patou registers as one of the founders of haute couture. For those who are of the fledgling fashionista variety, the name Jean Patou is one that provides foundational material to the history and origins of modern fashion. 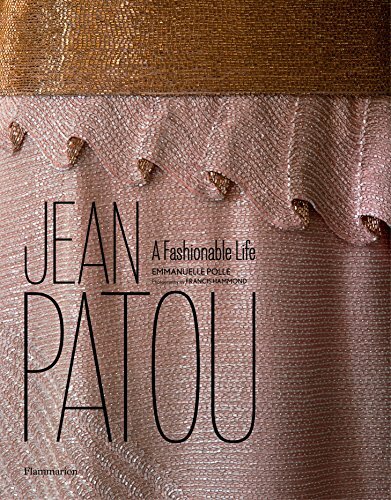 Jean Patou: A Fashionable Life is a monograph in the truest sense covering the life and career of Jean Patou from a business standpoint as well as from a personal one. It would shock me if anyone could really easily or unequivocally state exactly what Monsieur Patou was really famous for, aside from his perfume JOY. Emmanuelle Polle offers the reader an unusually precise accounting of life and times of the man whose name is synonymous with French fashion as well as French perfume. There is so much here about why Monsieur Patou should be even more revered and recognized within the annals of fashion history; unfortunately he seems to have been overshadowed by one of his contemporaries, namely Gabrielle Coco Chanel. Did you know it was Patou who was the first to show his haute couture collections in the evening, and that the collections were comprised of some 300 pieces that included everything from undergarments to fur coats and everything in between? Did you know that Monsieur Patou lead a very abbreviated life of only 49 years, and during that time he owned and operated businesses that employed hundreds of workers who only produced products under the Jean Patou name? Might you have known that Patou was quite a ladies’ man in his day as well as a sportsman, and that he was the first to market a unisex scent? Jean Patou: A Fashionable Life is a book that can be and should be read for intellectual fulfillment, and sheer entertainment as a real life French fairy tale that revolves around the world of fashion. The book is a must read for those who wish to round out and enhance their knowledge of fashion—and definitely for those who are just learning about the subject.